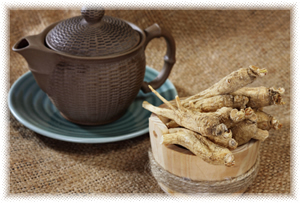 Ginseng roots, or root powder can be used in tea, the powder is much easier to work with. The tea is mild, slightly sweet, with a hard to describe but distinctive taste. Recipe Instructions: Decoction :Use 1 teaspoon of powder to each cup of water. Bring to a slow boil and simmer covered for 10 minutes. Turn off heat, and let stand until cool enough to drink.